Lamm Industries M1.2 Reference Pure Class A Hybrid Monoblock Amplifier. 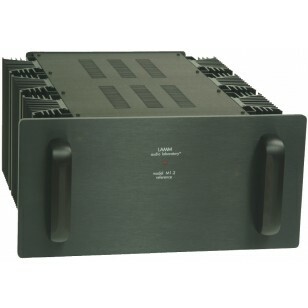 Pure Class A hybrid amplifier producing 110 Watts into 8 AND 4 Ohms, 400 Watts into 2 Ohms, 600 Watts into 1 Ohm (continuous). Features hybrid vacuum tube/sold-state design with one specially selected 6922 vacuum triode. 12 high speed MOS-FET output transistors, no overall feedback. Switch-selectable bias/voltage settings for 8- or 4-Ohm operation. XLR and RCA inputs; 2 pairs of binding posts. Remote control: power on/off. 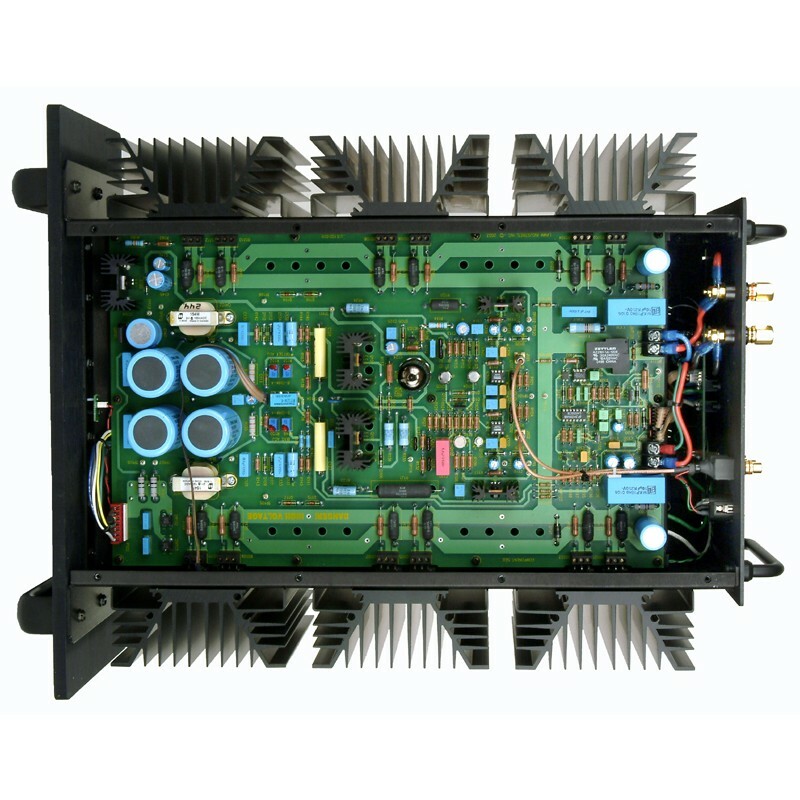 Description: Hybrid monoblock power amplifier with solid-state input stage, tubed driver stage, MOSFET output stage, comprehensive short-circuit protection, and high- and low-impedance bias settings. Tube complement: one 6922. Inputs: balanced on XLR with pin 2 wired hot; 2 single-ended on RCA connectors in parallel with pins 2 and 3 of XLR; 12V trigger. Outputs: 2 sets brass, gold-plated binding posts. 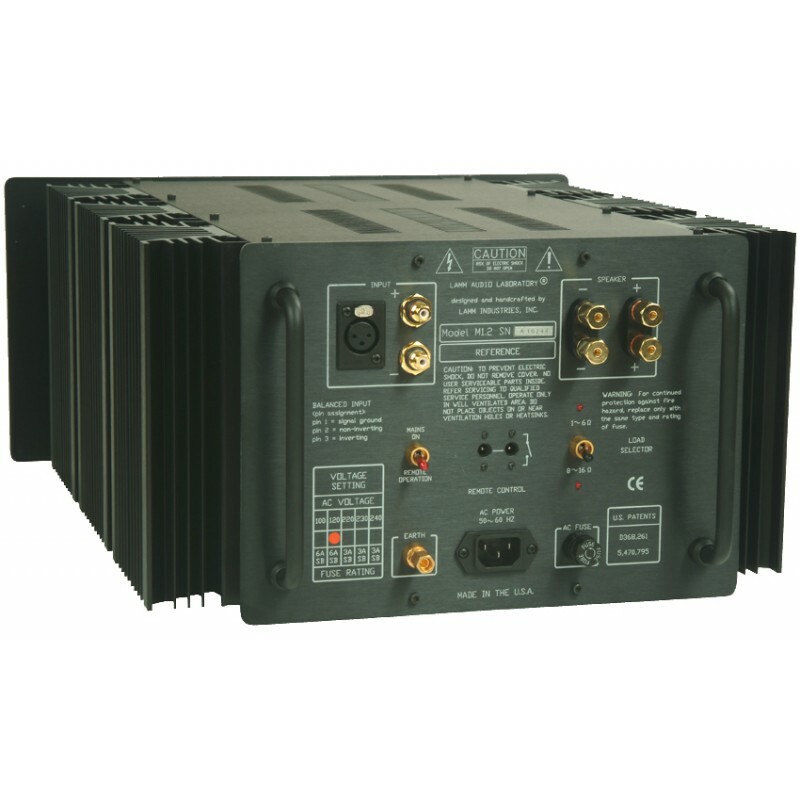 Rated output power, high-impedance setting (minimum continuous sinewave power, 20Hz–20kHz): 110W into 8 ohms (20.4dBW) at <0.3% THD, 220W into 4 ohms (20.4dBW) at <0.5% THD, 400W into 2 ohms (20dBW) at <1% THD, 600W into 1 ohm (18.75dBW). Rated output power, low-impedance setting (minimum continuous sinewave power, 20Hz–20kHz): 110W into 4 ohms (17.4dBW) at <0.5% THD, 220W into 2 ohms (17.4dBW) at <1% THD, 400W into 1 ohm (17dBW). Frequency responses: 4Hz–155kHz, +0/–3dB (high-impedance setting at 110W into 8 ohms at rated line voltage); 4Hz–155kHz, +0/–3dB (low-impedance setting at 110W into 4 ohms at rated line voltage). Voltage gain: 39 ±2% or 31.8dB ±0.2dB. Signal/noise (ref. 29.7V RMS into 8 ohms [110 W], 22Hz–22kHz): typically 89dB, typically 96dB A-weighted. Input sensitivity: 761mV RMS ±2% for 110W into 8 ohms (high-impedance setting); 538mV RMS ±2% for 220W into 2 ohms (low-impedance setting). Input impedance: 41k ohms shunted by 470pF. Output impedance (20Hz–20kHz): typically 0.082 ohm, +0.007/–0.002 ohm. Power consumption: Typically 330W at rated output at 8 (4) ohms (class-A operation) and at idle. Dimensions: 17" (432mm) W by 8.25" (210mm) H by 19.5" (495mm) D. Add 2.8" (714mm) D for front and rear handles. Weight: 68.5 lbs (31kg) net, 94 lbs (42.7kg) shipping.